The inauguration of the 45th President of the United States, Donald Trump, is now official. And the left, naturally, had a cow over it. Which, of course, means we’re on the “right” course. 1.) The Ben Carson Takedown. I know the left is referring to it as the American Carnage speech, but Trump’s takedown of the eight years of the Obama administration – with Barack Obama sitting right next to him and unable to do anything about it – reminded me of the Prayer Breakfast speech delivered by Dr. Ben Carson a couple years ago at which the world-renowned neurosurgeon filleted ObamaCare with Obama sitting right next to him. It was a thing of beauty. And just hours later, the Senate confirmed as our new Secretary of Defense the man who’s gonna do it: General James “Mad Dog” Mattis. As was said of Gen. George Patton in the 1970’s blockbuster movie of the same name, “The lions in their dens tremble at his approach.” Sic ‘em, Mad Dog! 3.) Michelle’s Hell. It’s widely understood that the rough-and-tumble of politics often hits spouses harder than the candidates themselves. 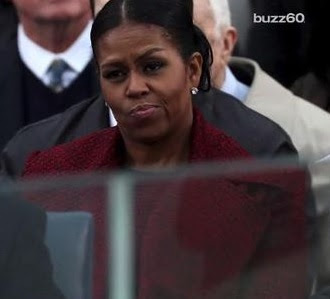 And that was abundantly clear of former First Lady Michelle Obama at the swearing-in ceremony. Her face throughout looked as if she’d just eaten a sour pickle coated with pure lemon juice. What a contrast with the pure elegance of incoming First Lady Melania Trump, who was absolutely stunning at the inaugural balls later in the evening. Move over Target and J. Crew; “Camelot” is back in style. 4.) The Return of Reagan-O’Neill. Much was made of the personal relationship between former President Ronald Reagan and former House Speaker Tip O’Neill during Reagan’s presidency. The pair privately had a warm, personal relationship despite often acrimonious public spats on issues of policy. During a post-inauguration bill-signing ceremony, the same sort of relationship was demonstrated between Trump and Senate Minority Leader Chuck Schumer. The two have known each other a long time and Trump has donated generously to Schumer’s campaigns over the years. Too early to predict a “bromance,” but this could augur well for future negotiations on sticky legislative matters. I was also struck by the class Trump showed in asking the crowd to stand and recognize Hillary Clinton at the afternoon’s lunch in Statuary Hall. And I thoroughly enjoyed the entertainment at the inaugural balls. Did anyone miss not seeing self-proclaimed “A-list” celebrities such as Bruce Springsteen or Cher? Not me. And now the work begins. Time to make America great again. A major brouhaha has erupted over a $1.2 million NO BID contract that’s been awarded to a politically connected consultant to oversee the reorganization of the Clark County school district. A lawsuit has been filed – which ultimately will be paid by taxpayers – and questions have been raised about the “backroom discussions” and “secretive nature” of the process that awarded the contract. This is exactly the kind of “insider” stacked-deck games that President Donald Trump is talking about when he calls for “draining the swamp.” It’s not just a DC problem. And we have another such situation developing at the Las Vegas city council, where a new 15-year NO BID contract extension for trash collection is being mulled for Republic Services. A proposal has been submitted to the council that’s harder to find on the city’s website than Waldo. But even if you succeed in retrieving it from cyber-space, an official at Republic told me it’s already been altered with significant changes. Alas, those changes remain as secret as Colonel Sanders’ finger-lickin’ good chicken recipe. On Friday, Citizen Outreach filed a public records request – Nevada’s version of FOIA (Freedom of Information Act) – with city manager Betsy Fretwell asking for updated working documents of the deal. We also filed a request for a legal opinion with the city attorney Brad Jerbic asking if an approved renewal of the NO BID contract by the council would be subject to a voter referendum. That seems to be a gray area in state law. You can read the records request HERE and the legal opinion request HERE. Don’t get me wrong. I’m not saying Republic isn’t doing a good job. And I’m not saying their proposal is bad or flawed. I’m saying the taxpayers deserve to have this matter handled transparently in the full light of day and that it should be open to competitive bidding. The Trump presidency has thrown down the gauntlet to the government at every level and declared that “business as usual” is over. Let’s hope City Hall gets the memo.